Tozer: This is not to preach sinless perfection. This is to say that every known sin is to be named, identified and repudiated, and that we must trust God for deliverance from it, so that there is no more sin anywhere in our lives. It is absolutely necessary that we deal thus, because God is a holy God and sin is on the throne of the world. Tozer: I do not mean by this that you cannot have things. I mean that you ought to get delivered from this sense of possessing them. This sense of possessing is what hinders us. All babies are born with their fists clenched, and it seems to me it means: "This is mine!" One of the first things is "mine" in an angry voice. That sense of "This is mine" is a very injurious thing to the spirit. If you can get rid of it so that you have no feeling of possessing anything, there will come a great sense of freedom and liberty into your life. 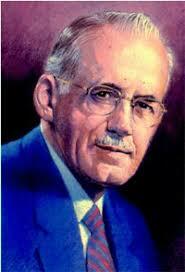 Tozer: We´re all born with a desire to defend ourselves. And if you insist upon defending yourself, God will let you do it. But if you turn the defense of yourself over to God He will defend you. (4) NEVER SPEAK BADLY OF OTHERS. Tozer: "Love covers a multitude of sins" (1 Peter 4:8). The tale bearer has no place in God´s favor. If you know something that would hinder or hurt the reputation of one of God´s children, bury it forever. Find a little garden out back-a little spot somewhere-and when somebody comes around with an evil story, take it out and bury it, and say, "Here lies in peace the story about my brother." God will take care of it. "With what judgment ye judge, ye shall be judged." (Matthew 7:2). (5) NEVER ACCEPT ANY GLORY. Tozer: God is jealous of His glory and He will not give His glory to another. He will not even share His glory with another. It is quite natural, I should say, for people to hope that maybe their Christian service will give them a chance to display their talents. True, they want to serve the Lord. But they also want other people to now they are serving the Lord. They want to have a reputation among the saints. That is very dangerous ground-seeking a reputation among the saints. It´s bad enough to seek a reputation in the world, but it´s worse to seek a reputation among the people of God. Our Lord gave up His reputation, and so must we. May God give us the grace and strength to trust Him in each of these areas. Amen.